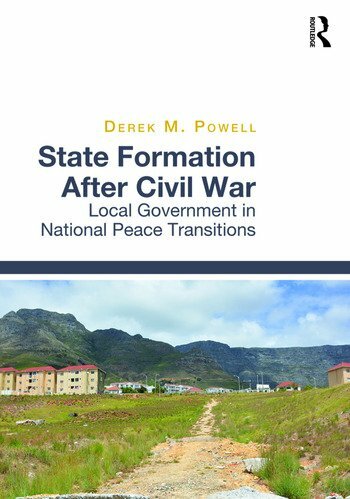 State formation after civil war offers a new model for studying the formation of the state in a national peace transition as an integrated national phenomenon. Current models of peacebuilding and state building limit that possibility, reproducing a fragmented, selective view of this complex reality. Placing too much emphasis on state building as design they place too little on understanding state formation as unplanned historical process. The dominant focus on national institutions also ignores the role that cities and civic polities have played in constituting the modern state. Mining ideas from many disciplines and evidence from 19 peace processes, including South Africa, the book argues that the starting point for building a systematic theory is to explain a distinct pattern to state formation that can be observed in practice: Despite their conflicts people in fragile societies bargain terms for peaceful coexistence, they make attempts to constitute the right to rule as valid state authority, in circumstances prone to conflict, over which they have imperfect influence, not control. Though the kind of institutions created will differ with context, how rules for state authority are institutionalized follows a consistent basic pattern. That pattern defines state formation in peace transitions as both a unified, if contingent, field of normative practice and an object of comparative study. Where the national-centric models see local government as a matter belonging to policy on decentralization for later in the reconstruction phase, the book uncovers a distinct "local government dimension" to peace transitions: A civic dimension to national conflicts that must be explained; incipient or proto-local authorities that emerge even during civil war, in peace making, after state collapse; the fact that it is common for peace agreements and constitutions to include rules for local authority, for local elections to be held as part of broader democratization, and for laws to be enacted to establish local government as part of peace compacts. The book develops the concept of local peace transition to explain the distinctive constitutive role of this local dimension in peace-making and state formation. This path-breaking book will be of compelling interest to practitioners, scholars and students of comparative constitutional studies, international law, peace building and state building. Derek Powell is an Associate Professor in Law and Head of the Multi-Level Government Initiative in the Dullah Omar Institute of Constitutional Law, Governance and Human Rights at the University of the Western Cape. He served as a deputy director-general, senior civil servant and policy advisor in the South African government under the Mandela and Mbeki administrations (1996-2009), where he worked on key policy processes to establish and reform the systems of democratic local government and intergovernmental relations. He was head of the research department at the Constitutional Assembly during the process to draft a democratic constitution for South Africa (1994-96). His research interests focus on comparative constitutional studies, international peace and security law and politics, local government, intergovernmental relations, public finance management, and more recently on using large datasets in researching complex problems of governance that cut across the law, state, economy, and society. He is co-editor of Jaap de Visser, Nico Steytler, Derek Powell, Ebenezer Durojaye eds., Constitution Building in Africa (Nomos, 2015).